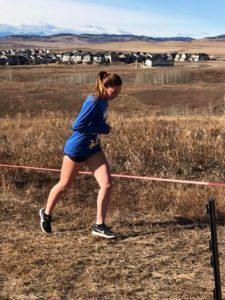 Congratulations to the Panthers athletes who attended the Dino Classic in Calgary. 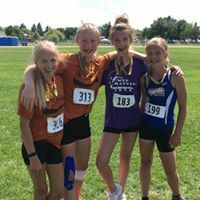 It was a great meet- for many a new experience! Thank you Coach Mike, Coach Amanda and Coach Jasmin for attending. A message from Coach Amanda. Dino Results – many athletes had PBs or placed in the top 10. Many of the athletes this was their first meet of the year OR THEIR FIRST EVER indoor meet. 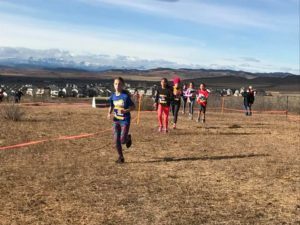 The provincial meet was Nov. 3 in Cochrane, Alberta. Coach Darryl Smith accompanied 8 athletes, as well as took to the course himself. 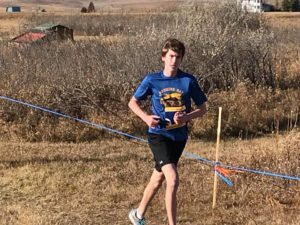 Coach Darryl said: The athletes that went to the AA cross country’s running provincials certainly left it out on the course. The effort level was phenomenal. 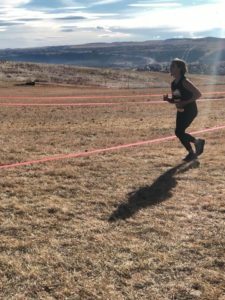 Watching our athletes run, push through the pain, while running a tough course was inspirational. As a coach I could not have been prouder. Watching the panthers hoodies and singlets run around the course was awesome. 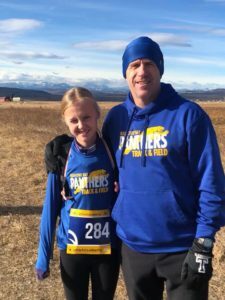 We ran with best in Alberta and never wavered. 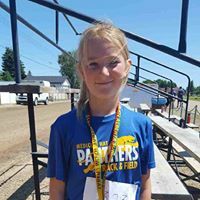 The Panthers track club had quite a few kids attend CALTAF in June, in an attempt to make the Legions Alberta -NWT team, however none were chosen. 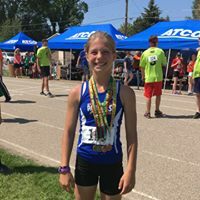 Being chosen to a Provincial team is one of 2 ways to attend Legion Nationals for track and field. The 2nd way is to attend as a club athlete if you have achieved standard in any event. Joshua Suelzle, Aayden Callan and Dylan Callan had achieved national standard and chose to attend Nationals alongside Panthers Coach Darren Klein. Joshua Suelzle went in 3 U18 Youth throwing events. He placed 15th in Discus (a fault and 2 throws 31.07m/34.39m) and 14th in Shot Put with a throw of 12.11m. 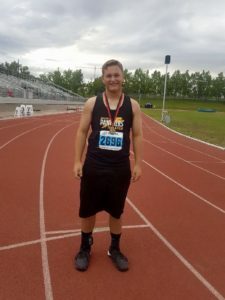 Neither event did he beat his qualifying seed distances, which had him placing first at CALTAF and High school Provincials (SP seed: 13.79m & Discus 39.4m) Joshua had a great day at Javelin, smashing his old seed and setting a new personal best 6.5m further, finishing 11th with a throw of 50.61m. Dylan Callan threw the shot put 12.03m, landing him in 9th in the U16 Midget category. His best this season was 12.53m, placing him 1st at CALTAF. Aayden Callan bombed the discuss 41.39m, toppling his precious PB of 40.26m (set at ASG trials), coming in 9th in the U16 Midget category. CONGRATS to Jaylaina CALLAN, Zachary CAMPBELL, Orin MAY, Sarah PIMBLETT & Joshua SUELZLE for making the 2018 ASG team! Post 3 of 3The CALTAF classic wrapped up today. 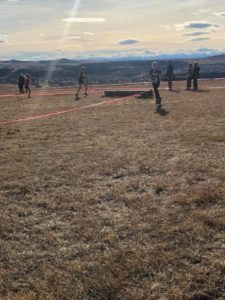 The weather Saturday made for a TOUGH day – we really don’t have the ‘opportunity’ to train in such icky conditions regularity. But the sun today ended the weekend on a beautiful note. Every. Single. Panther. Athlete. deserves a pat on the back. This is a huge meet and the competition is STEEP. FURTHER – you cheered on your team mates, you celebrated other athlete successes, you found more exposure to new competition – you competed. Good job. 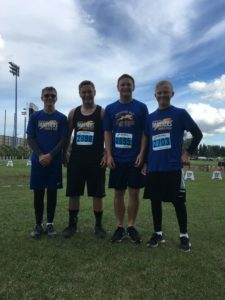 MASTERS ATHLETESBRENT FRIESEN:SP – 2nd (9.51m) DARRYL SMITH:3000m – 5th (11.33.30)800m – 2nd (2.34.78) OPEN (18-34)ETHAN HICKS:200m – 17th (23.00)100m – 24th (11.42) LANDON SWARTZ:1500m – 15th (4.22.20)3000m – 1st (9.23.67) PAYTON LAWSON:1500m – 24th (5.19.50)3000m – 4th (11.31.33) JAXON MAY:400m – 29th (53.51)800m – 27th (2.05.66) NATASHA MCGRAW:Javelin – 9th (17.59m)SP – 10th (6.98m)Discus – 11th (23.14m) YOUTH (16/17)JOSHUA SUELZLE:Discus – 1st (39.4m)SP – 1st (13.79m)Javelin – 4th (44.04m) LUCAS HERTER:100m – 14th (11.99)200m – 8th (23.59)400m – 7th (52.89) ORIN MAY100m – 23rd (12.03)110m H – 13th (17.33)200m – 19th (24.29) BETHANY REGIER:1500m – 15th (6.02.94)3000m – 6th (13.28.93) KYLE SPACKMAN:LJ – 4th (6.27m)Pole Vault – 2nd (3.2m) AIMEE MAURICE:Pole Vault – 6th (2.35m) JANELLE STEGEN:High Jump – 11th (1.35m)Javelin – 6th (26.52m) GLORIA LOKBAI:High Jump – 5th (1.60m) ZACHARY CAMPBELL:Javelin – 8th (39.65m)100m – 13th (11.96)200m – 12th (23.79)400m – 23rd (55.71) ELIAS SMITH:3000m – 12th (10.53.97)800m – 38th (2.20.72) HANNAH KOZAKEWICH (competing as Youth):3000m – 4th (12.22.50) MIDGET (14/15)TRISTAN FRiESEN:Discus – 5th (31.12m)Javelin – 5th (32.83m)SP – 10th (8.64) RILEY FRIESEN:SP – 5th (10.21m)300m – 17th (43.83)100m – 26th (13.40)200m – 28th (27.59) GAGE SMITH:2000m – 8th (8.00.75)800m – 25th (2.38.69) JAYLAINA CALLAN:Discus – 6th (20.65)Javelin – 14th (17.56)SP – 7th (8.34m) AAYDEN CALLAN:SP – 6th (10.08m) DYLAN CALLAN:SP – 1st (12.53m) BANTAM (12/13)CLARK CAMPBELL:Discus – 6th (21.46m)SP – 3rd (8.72m)LJ – 26th (2.9m) ZAYNNA WILLOOUGBY:Discus – 25th (13.55)HJ – 13th (1.2m)LJ – 21st (3.4m)SP – 17th (6.44m)600m – 25th (2.05.07)80m – 35th (12.29)80m H – 25th (17.92)800m – 28th (3.11.65) RYANN PLAKSEY:Discus – 23rd (13.92)HJ – 20th (1.1m)LJ – 46th (2.15m)SP – 28th (5.38m)600m – 10th (1.57.65)80m – 41st (12.44)80m H – 34th (19.03)800m – 15th (2.57.07) CAMRYN BURGEVITZ:Discus – 27th (13.11m)LJ – 40th (2.82m)SP – 22nd (5.73m)600m – 42nd (2.46.39)80m – 36th (12.31)80m H – 32nd (18.97)800m – 38th (3.49.27) PEEWEE (10/11)ADRIENE CAMPBELL:LJ – 10th (3.25m)SP – 3rd (7.13m)600m – 21st (2.15.86) TYKE (9u)SYDNEY BURGEVITZ:Standing LJ – 8th (1.36m)Running LJ – 15th (1.93m)Ball throw – 9th (10.35m)SP – 13th (3.1m)60m – 6th (10.74)600m – 4th (2.20.76) Big congratulations to JOSH Suelzle for winning 2 events (Discus & SP)Big congratujatiobs to LANDON Swartz for winning the 3000m!Big congratujatiobs to DYLAN Callan for winning the Midget SHOT PUT!Thank you Coach Jasmin, Coach Klein, Coach Brent, Coach Austin & Coach Mike for everything this weekend!